“I definitely wasn’t expecting it. I equate a few things to it, though. There was some growing excitement and chatter behind it before we opened. My co-workers are very present in the community, and they have their own following behind them,” said Sposito. Cloven Hoof Brewery Co. became a vision for Sposito for several reasons, including the growing demand over the past few years. “I’m really passionate and I love beer. I also saw that over the past six to eight years, there were only three taps on the street. Now there’s at least 40. You can just see the growth of beer. It’s really starting to become common,” said Sposito. Sposito has been in Ashtabula all of his life, growing up right on Walnut Boulevard. After touring with his band for five years, Sposito returned to help work with his sister-in-law Kelly Sposito, owner of the Harbor Perk Coffee House. “This is a beautiful place and there’s a lot of opportunity on the street. I wanted to build something here. I really love the community, and wanted to help with the legacy of what my brother started,” Sposito said. The Cloven Hoof is the name of the first band Sposito and his late brother and former Harbor Perk owner Jake Sposito played in. After working at Harbor Perk for ten years, Sposito gained a lot of respect and made relationships with individuals that helped him develop the brewery. “Working here at Harbor Perk, I learned everything I needed to know. It’s a giant networking hub. I met every contractor, every electrician, every plumber that I needed to know and they all know who I am and respect me for what I have done here for the last 10 years and the product I provided. And they put faith in me, they took hits, and helped me get open. My communal presence is something I took advantage of to be where I am,” said Sposito. Cloven Hoof Brewery produces ten signature drafts that are unique to the business. Currently, one of the best sellers is called Sailing Goat, which utilizes ingredients from Harbor Perk coffee and chocolate from Marianne’s Chocolates. “I like to create good beer. I respect my product and I like to keep a classy crowd, people that are respectable and want to try good beers. That’s how you have a non-abusive atmosphere. If you want to get crazy or do shots, go down to the dive bar down the street where they don’t have my beer,” said Sposito. The environment of the brewery also encourages a genuine, fun crowd. According to Sposito, those that aren’t fond of beer, should still come and visit the business. “Eliminate your digressions. Come with an open mind. If you don’t like a certain beer style, know I didn’t make it like that. I have had so many people in there saying they don’t like beer, then try something and end up loving it. You have to give it a shot without bias,” Sposito said. Sposito is working toward bettering the business and continuing to transform as Bridge Street continues to expand. “I am lucky to be involved with Bridge Street at this time. It’s an opportune time to open a business here. Every year we have two to three businesses added. People down here have a strong passion in wanting to help this place grow and that is important,” he said. Sposito has plans of his own for expansion. 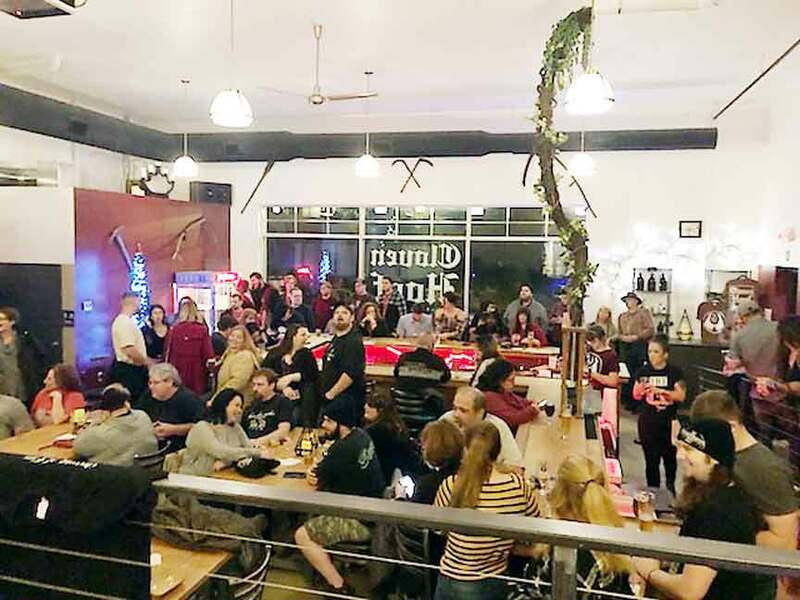 With the help of his dedicated staff and brewing partner Joe DeDomenic, The Cloven Hoof Brewery’s popularity has grown considerably over the last four months. Along with DeDomenic, Sposito acknowledges his sister-in-law Kelly’s help with getting his business together. “She’s my right-hand man and guiding light in my life with this business. She always is giving me insight. Really, everything I learned came from her. She is so unique with her business and she had no ego. She makes the coffee shop very safe and approachable for everyone,” he said. Currently, Cloven Hoof Brewery is open Thursday through Friday, 4-10 p.m., Saturday, 2-11 p.m. and Sunday, 12-6 p.m.
For more information, visit www.facebook.com/Cloven-Hoof-Brewing-Co- or call (440) 536-4344. Weekends are packed in the brewery with local residents and visitors from out of town.